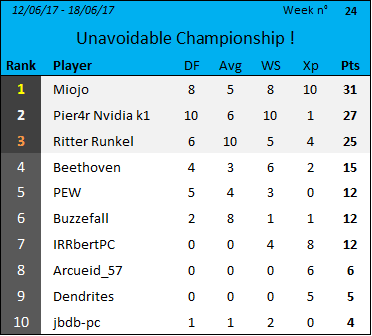 Board index Tournaments Unavoidable tournaments Unavoidable Championship ! This championship is the ultimate competition of Gladiabots ! 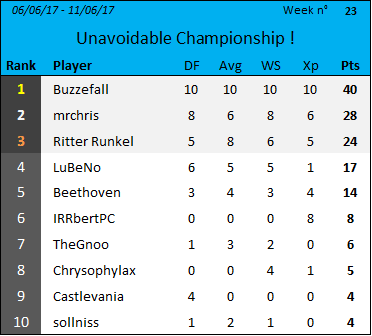 Each week, the player with most points wins the Championship. Last edited by TheGnoo on 20 Jul 2017, 14:58, edited 12 times in total. Last edited by TheGnoo on 19 Jul 2017, 16:43, edited 3 times in total. 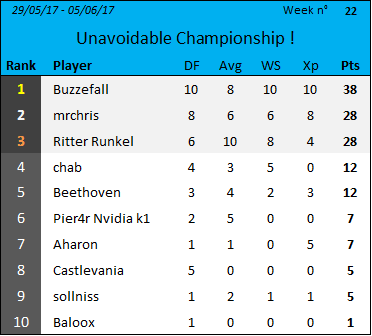 Hope you guys enjoy the idea of regrouping pier4r's tournaments in a single championship. If you see any (english) mistake, if you have comments, please tell me! Oh kudos for the patience, looks good! 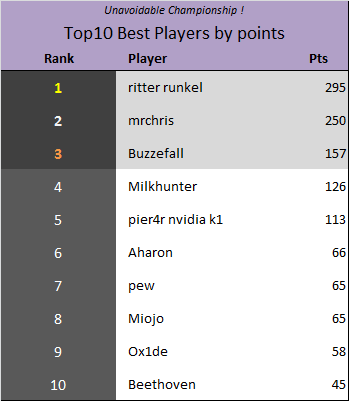 You can make the hall of fame of whom has won more 1st places, 2nd places, 3rd places as I do in my threads and you can make the hall of fame of whom got more points in general (I expect ritter towering in terms of total points won). 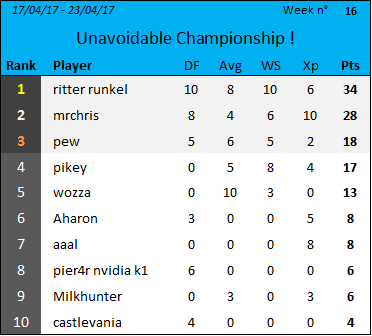 Also the last week was 20170529-20170604 not 05. tell me if you notice wrong data in my tournaments as well. I am curios about the past results too! Now only the new ones! pier4r wrote: I am curios about the past results too! Now only the new ones! 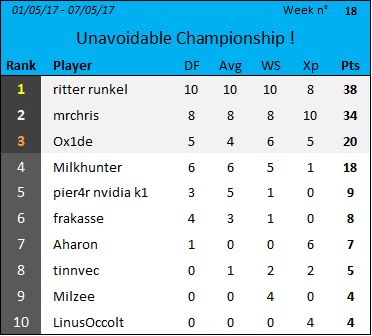 I will post the new and past results tonight (tomorrow for Europeans) but anyway I can't go furthest than your database. It's all pier4r's work. Hope it can motivate you to play despite the small amount of big players in GML. TheGnoo wrote: Thanks for the feedback. Sure, but AFAIK you can go back for at least 20 tournaments, so quite a bit. If you do one new one old is cool. and there is currently only 8 weeks for each tournament. Buzz strikes again, far away from the others. Last edited by TheGnoo on 22 Jun 2017, 03:28, edited 1 time in total. 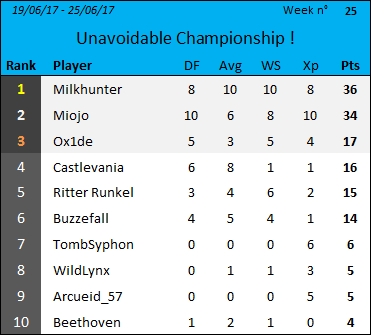 BTW, who is Miojo, new player or smurf ? You got winning streaks confused. 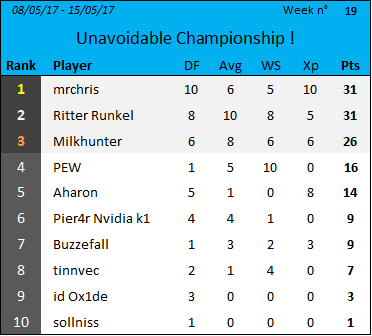 I still request the old championships! Wow, it's quite impressive then. 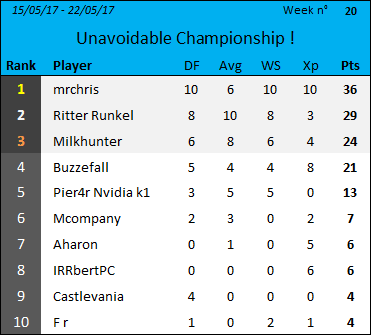 I'll focus on old championships until pier4r has time to compute and post his datas. Hall of Fame is now here, I'll improve it and put more datas and information asap. 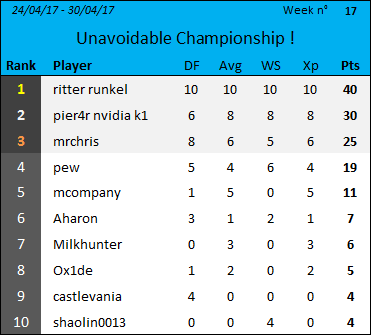 I stopped computing at week 16 because it costs too much time to extract datas from previous pier4r's posts.